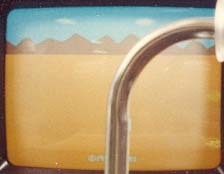 Tumbleweeds was one of only two games made specifically for Atari's Puffer Project (Jungle River Cruise was the other). So what is the Puffer Project you ask? Well basically the Puffer was an exercise bike that was hooked up to an Atari 400/800 or 5200 system. The player would control which direction they would move by using two specially designed hand controllers, while the actual motion was controlled by how fast the player peddled. Sound a bit far fetched? Well as it turns out Atari was once again ahead of their time. The philosophy behind the Puffer was to try and make exercising fun. Atari figured that if players had to interact physically with the game their enjoyment would increase while their waistlines decreased. Given the problem of obesity in most video game players today, Atari might have been onto something. However since the player was basically using the exercise bike as a giant controller normal games couldn't be used with the Puffer (although Atari did try and adapt Ms. Pac-Man and Pole Position to use the Puffer), so a series of new games had to be created specifically for the Puffer. The first of these new games was Tumbleweeds. Unlike Jungle River Cruise, Tumbleweeds is a game that can only be enjoyed with the Puffer. After playing the game for only a few seconds it quickly becomes obvious why this is. The whole goal of Tumbleweeds to peddle towards a set of mountains on the horizon while avoiding tumbleweeds and cacti that get in your way. Without the Puffer to get your blood pumping, Tumbleweeds quickly becomes a dull sprite-scaling demo. Tumbleweeds uses an interesting first person perspective to help give the player the impression that they really are cycling through a barren desert. As the tumbleweeds and cacti come into view the player must quickly move to the left or right (using the handlebar buttons) to avoid hitting them. While there isn't a true objective in the game, the overall goal is to see how fast you can peddle and still avoid the oncoming objects. Fun for the whole family! (except Grandpa and Grandma). While the game may not scream excitement, Tumbleweeds is an interesting example of an alternative use for the 5200. Unlike Jungle River Cruise, Tumbleweeds was designed to be a leisurely simulation game for people who wanted a simple task to keep them busy while they exercised. The only known Tumbleweeds prototype is housed in a regular Star Raiders cartridge and is currently in the possession of John Hardie. Hopefully the rom will eventually be released to the public so the entire community can enjoy this unique game.